Microscopic particles of plastic could be poisoning the oceans, according to a British team of researchers. They report that small plastic pellets called "mermaids' tears", which are the result of industry and domestic waste, have spread across the world's seas. The scientists had previously found the debris on UK beaches and in European waters; now they have replicated the finding on four continents. Scientists are worried that these fragments can get into the food chain. Plastic rubbish, from drinks bottles and fishing nets to the ubiquitous carrier bag, ends up in the world's oceans. Sturdy and durable plastic does not bio-degrade, it only breaks down physically, and so persists in the environment for possibly hundreds of years. Among clumps of seaweed or flotsam washed up on the shore it is common to find mermaids' tears, small plastic pellets resembling fish eggs. Some are the raw materials of the plastics industry spilled in transit from processing plants. Others are granules of domestic waste that have fragmented over the years. Either way, mermaids' tears remain everywhere and are almost impossible to clean up. Dr Richard Thompson at the University of Plymouth is leading research into what happens when plastic breaks down in seawater and what effect it is having on the marine environment. He and his team set out to out to find out how small these fragments can get. So far they've identified plastic particles of around 20 microns - thinner than the diameter of a human hair. In 2004 their groundbreaking study reported finding particles on beaches around the UK. Historical records of samples taken by ships plying routes between Britain and Iceland confirmed that the incidence of the particles had been increasing over the years. Now the team has extended its sampling elsewhere in Europe, and to the Americas, Australia, Africa and Antarctica. 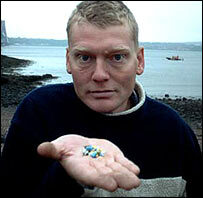 BBC correspondent Tom Heap holds examples of "mermaids' tears"
They found plastic particles smaller than grains of sand. Dr Thompson's findings estimate there are 300,000 items of plastic per sq km of sea surface, and 100,000 per sq km of seabed. So plastic appears to be everywhere in our seas. The next task was to try and find out what kind of sea creatures might be consuming it and with what consequences. Thompson and his team conducted experiments on three species of filter feeders in their laboratory. They looked at the barnacle, the lugworm and the common amphipod or sand-hopper, and found that all three readily ingested plastic as they fed along the seabed. "These creatures are eaten by others along food chain," Dr Thompson explained. "It seems an inevitable consequence that it will pass along the food chain. 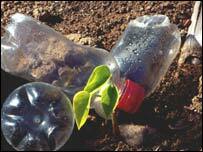 There is the possibility that chemicals could be transferred from plastics to marine organisms." There are two ways in which this might happen. Firstly, the Plymouth scientists want to establish whether there is the potential for chemicals to leach out of degraded plastic over a larger area after the plastic has been ground down. The second aspect of this research is focusing on what happens when plastic absorbs other contaminants. So-called hydrophobic chemicals such as PCBs and other polymer additives accumulate on the surface of the sea and latch on to plastic debris. "They can become magnified in concentration," said Richard Thompson, "and maybe in a different chemical environment, perhaps in the guts of organisms, those chemicals might be released." Whether plastics present a toxic challenge to marine life and subsequently to humans is one of the biggest challenges facing marine scientists today. The plastics industry's response is that much of the research is speculative at this stage, and that there is very little evidence that this transfer of chemicals is taking place in the wild. It says it is doing its bit by replacing toxic materials used as stabilisers and flame retardants with less harmful substances. Whatever the findings eventually show, there is little that can be done now to deal with the vast quantities of plastic already in our oceans. It will be there for decades to come. Costing The Earth: Mermaids' Tears will be broadcast on Friday 8 December on BBC Radio 4 at 1500 GMT. You can also listen online for 7 days after that at Radio 4's Listen again page.